Our industry-leading platform helps organizations communicate with employees, clients, prospects and partners with measurable and greater impact. ON24 is used enterprise-wide for applications such as demand generation, partner enablement, virtual talent development, product launches, company town hall meetings and user conferences. 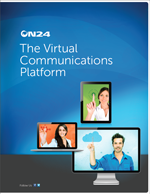 Download the ON24 Virtual Communications Platform: a corporate brochure featuring an overview of ON24 and its products.